What would have once only been considered fodder for variety shows or slapstick comedy, men dancing en pointe has become big business for Les Ballets Trockadero de Monte Carlo. The all-male ballet company was founded in New York in 1974, and has performed in over 500 cities worldwide since. “They’re not very easy to get. They are so busy — one of the busiest companies in the world,” explained Svetlana Dvoretsky, president of Show One Productions, who will be presenting the company in Vancouver this month at the Queen Elizabeth Theatre. Les Trocks, as they are affectionately known, seem to fill a niche in the ballet market, as no other company offers a show like theirs. “There is one company in Russia that is similar, but not on the same level,” said Dvoretsky. The success of their show comes not only from their comical parodies of classical ballets, but also from their impressive technique. “The show is very accessible,” said Dvoretsky. “Some people think it’s just a gay show or for gay people who like ballet, but it’s for all kinds of people.” Ballet aficionados will appreciate the quality of the technique and the references to classic ballets; others will appreciate the humour and dedication, and many more will be attracted by the show’s drag element. All the company members are ex-principals from professional ballet companies, and they all love what they do. “I think they’re very honest and sincere in what they do,” said Dvoretsky. “They don’t cut corners.” Their dedication is evidenced by the fact that the company has class every day unless they are travelling — even on performance days. While the company is comprised of only male dancers, their shows usually have both male and female roles; you’ll be sure to see a ballerina with a hairy chest wearing a tutu. “You have to relax right away and not take it too seriously,” laughs Dvoretsky. The show in Vancouver will include the company’s signature interpretation of Swan Lake, a section of various pas de deux from modern works, Go for Barocco (a Balanchine satire), and the Russian classic Paquita. “It does help if you know the history of classical ballets,” said Dvoretsky, but for those who need to brush up, a thick program is provided with synopses of all the ballets. Included in these programs are biographies of the dancers and their alter-ego characters based on famous ballerinas. Slapstick humour, hilarious interpretations of the classics, and impressive technique all make Les Trocks fabulous and unforgettable. 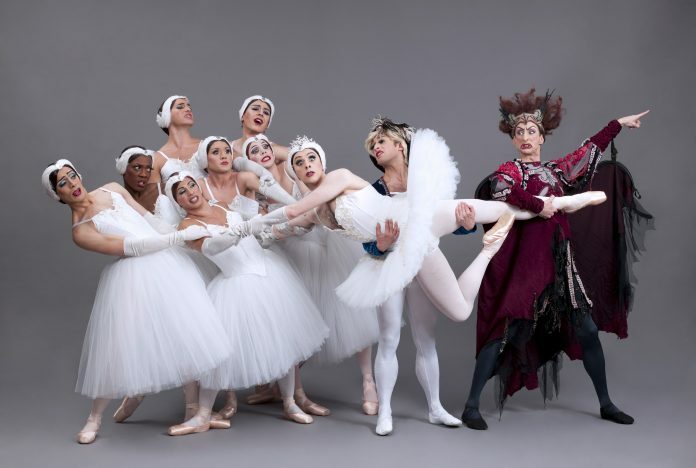 Les Ballets Trockadero will perform at the Queen Elizabeth Theatre on January 24. For more information visit trockadero.org.